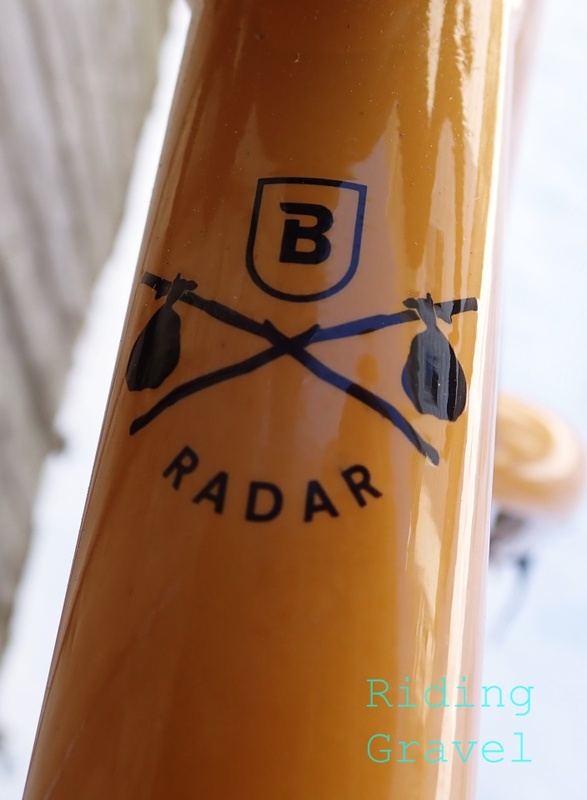 Breezer RADAR Expert: Getting Rolling- by Guitar Ted Adventure bikes. It is a term that is debated, celebrated, and tossed off as “just marketing“. However you view that term, it is undeniable that since the 2009 introduction of the Salsa Cycles Fargo, and their “Adventure by Bike” slogan came around, bicycle brands have seen a huge increase in interest in such bicycles. Some call them “gravel grinders”, “all-road” bicycles, or “bikepacking bikes”, but the main theme now for most companies, in the non-electric arena, is “gravel” and “adventure”. I had one U.K. based cycling media member tell me that, as a brand in the industry, “You cannot show up at a trade show without a gravel bike in the line.” So, for us here at RidingGravel.com, that’s a good thing. It seems that it has been for consumers as well, since this category of bicycle is one of, if not the only, growth sector in bicycle sales. So, taking that all into consideration, we were wondering what the new-to-gravel rider might find for a first time gravel bike out there. What if you are a rider that is just “gravel curious” and doesn’t want to spend a ton of money on a new bike to just check this scene out? Well, we have here a bicycle on test from Breezer Bikes which just may help us answer these and a few other questions. It is called the RADAR Expert, and in this post, we will take a closer look at this “made for adventure” rig. What It Is….. 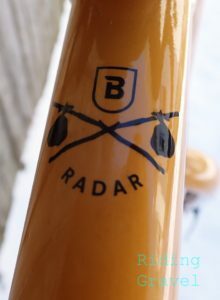 The RADAR, (It is an acronym for Road And Dirt Adventure Rig), is Breezer’s model which is aimed at getting the rider out to tackle their own adventures on dirt or gravel, bikepacking, or just exploring, in an economical manner. The RADAR Expert is the entry level to the range and features the same CroMoloy steel frame that the rest of the RADAR range gets. That would be a double butted, Joe Breeze designed tube set which is outfitted with rack mounts, fender mounts, and braze ons enough to fit five water bottles. Oh yeah, Joe Breeze, the man responsible for the first purpose built mountain bike. He’s still working and making designs for riders to enjoy today. That’s a good pedigree. This isn’t going to be a history lesson, but if you don’t know about Joe Breeze, look him up. The RADAR Expert, as all RADAR models, is based on a mountain bike drive train set up, so this bike is designed for deeper gears and wider tires. The RADAR can accept up to a 29″ X 2.2″ tire, but is spec’ed out of the box with WTB Riddler 45mm tires. The design also features a tall-ish head tube, a sloping top tube, and of course, Breezer Drop Outs. Real ones. Old fashioned quick releases secure the wheels here and “traditional” 135mm/100mm wheel spacing for the wheels means your older 29″er wheels will swap right in. There also is a threaded, external bearing bottom bracket, which should please those who have had issues with Press Fit style bottom brackets in the past. A “standard” 1 1/8th steer tube on the double butted CroMoly fork is held in place by an external cup head set. Pretty straight forward, well proven stuff here. This particular model features Shimano 9 speed gearing and a mix of Shimnao Sora shifter/brake levers with a Deore rear derailleur. Yes……9 speed allows this otherwise untenable solution to Shimano drop bar mtb goodness. Third party gizmos would be necessary had this been a 10 or 11 speed bike. Ah! The good old days! When mixing and matching was easy! The wheels are a set of Formula hubs laced to WTB STP i23 TCS tubeless ready rims shod with Riddler 45mm tires. Brakes are TRP HyRd hydraulic calipers which are cable activated. The rest of the bike is kitted out in mostly Breezer and Oval Components branded stuff which looks workmanlike and should prove serviceable for the purposes of this bike. Drive train duties are handled by the aforementioned 9 speed cassette, an 11-36T spread, and a Breezer branded crank set set up with 46/30 rings which should yield a wide enough gear range for most endeavors. The WTB Volt saddle with color matched logos is a nice touch on the bike. More spec info can be viewed on the RADAR Expert page here. First Impressions: When the RADAR Expert was chosen after we were contacted by Breezer for this review, I took a look at the website to get a preview on what to expect. I was pleasantly surprised to see that the paint wasn’t as “yellow” as it appeared on the site, but instead more like the “Black and Tan” that was listed in the spec. It’s a handsome, understated bike with cool little details in the graphics. The next thing you notice is how skinny those tubes are! In a world full of “Rubenesque” carbon tubes, heavily modified and molded aluminum, and even hydro-formed titanium, a basic, straight tubed steel bike stands out today more than ever. I grasped the top tube to lift the RADAR Expert out of its shipping box and the small diameter of the top tube was almost shocking. But that is the way almost every bike used to be, and Breezer has its roots in this traditional frame material, so it makes sense here. When you review so many mid-to high end bikes, you have to be careful when you look at an entry level steed. The parts and pieces have to all add up to meet a price point, and the RADAR Expert is no different in this regard at a MSRP of $1069.00. But, as I stated right out of the gate, the idea was to see what a new rider, or a rider looking to explore a gravel/adventure rig, might expect to find in a bike without having to mortgage your house to get a bike meant for this stuff. In this regard, I think a few things jumped out at me right away. I really liked that Breezer spec’ed the bike out with a tubeless ready rim, and the standard 45mm wide Riddler. Not everyone is going to go tubeless, and the bike comes set up with tubes, and not everyone will get on with the tire choice. So, Breezer doesn’t stick you with a tubeless ready tire at this price, (which would have required a downspec somewhere else, let’s not forget that) and if/when you go tubeless, you can choose whatever tire you want. Secondly, I saw the TRP HyRd brakes as a very inspired spec choice. These calipers have a good reputation for low maintenance and the entry level rider needs not concern themselves with all the nuances of hydraulic lines, hydraulic brake levers, and the subsequent bleeding/care that this entails. Cables can be found anywhere, and housings for brakes are cheap. Many bike shops may not have specific hydraulic bleed kits or even parts you might need if you have brake troubles should you take this somewhere remote. The HyRd gives you that hydraulic power, but without a lot of the potential downfalls of a fully hydraulic system. 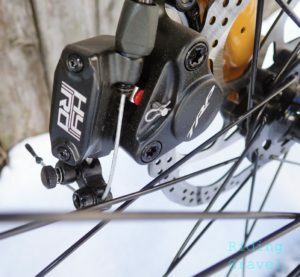 The choice of TRP HyRd calipers gives the owner of a RADAR Expert the power of hydraulic brakes without some of the hassles. I also thought that the choice of 9 speed components was a good one at this level for a couple of reasons. First- It allowed the matching up of a mountain bike derailleur and road shifter/brake lever from Shimano. The match up should work flawlessly. 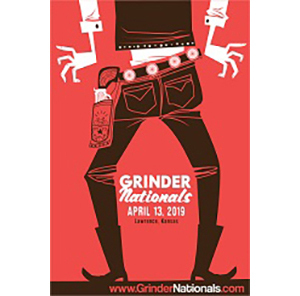 The other part about this that makes me feel positively about the choice is that new riders to adventure/gravel don’t need to find out that a cassette cost 100’s of dollars and chains are $50.00 when they wear out these commonly replaced drive train parts. 9 speed chains and cassettes can be purchased for under $50.00 all day for both components. That isn’t discouraging at all, where sometimes buying into high end stuff, then trashing it out in a month or so of gritty riding, can be a discouragement. The fit is a bit on the long side, as far as “reach” goes. That’s the feel that I and another fellow I let test ride this bike thought right away. Of course, this can be tweaked with an exchange of stems, but it bears mentioning. The geometry is interesting in that the RADAR features a pretty healthy 75mm bottom bracket drop and a slack-ish 71.5° head angle for this size Large test bike. The fork offset is 45mm, which is going to be on the stable side matched with that head angle. We will see how that plays out when we get to riding the RADAR Expert and that report will be included in the upcoming “Checkpoint” update on this review. So Far…. The Breezer RADAR Expert is a bike built for adventure and exploration. The steel frame is up for the task and the spec, while not spectacular, is decent and should provide good service and a low cost of maintenance. The TRP HyRd brakes, 9 speed mtb drive train matched with Shimano Sora shifters, and tubeless ready rims are highlights in the value department. We will see how the bike fares out in the wilds in our next update. 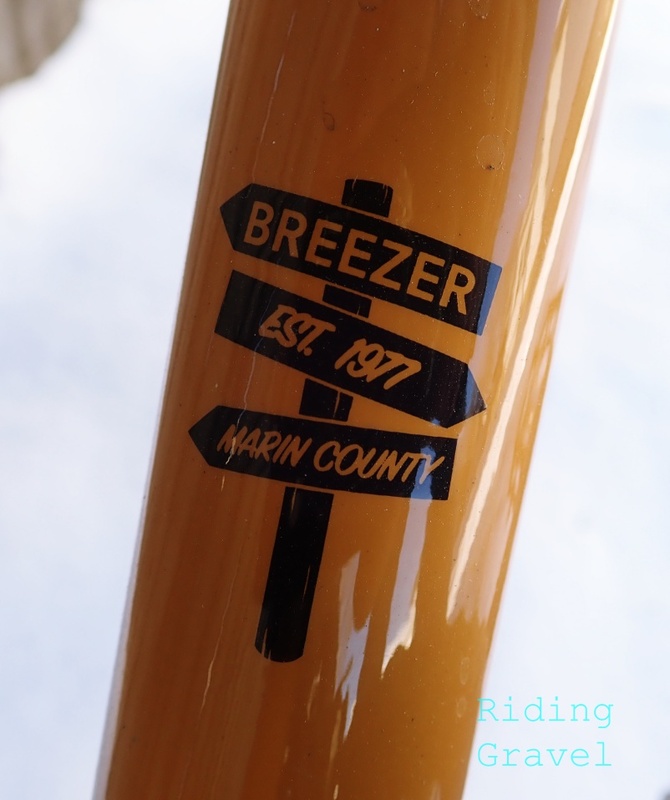 Note: Breezer Bikes sent the RADAR Expert over at no charge for test/review. We are not being bribed, nor paid for this review and we will strive to give our honest thoughts and opinions throughout. One nice thing using cable activated hydraulic brakes is that you can replace a caliper with a standard caliper if needed. @Jjames- Great point. Thanks for pointing that out. I looked at (and ended up buying) this bike model (Breezer Radar) about a year ago, and noticed it was approximately in line with several of the suggested geometry recommendations adopted for the Raleigh Tamland. I’ve been VERY happy with mine. I swapped out the OEM wheels and tires for a set of used Stan’s Arch EX wheels and Panaracer Gravel King SK’s and it’s a pretty sweet all-around setup. Great out on the gravel, as well as an urban commuter with all of the braze-ons. Microshift has a 10 speed bar end shifter compatible with Shimano Mountain/Dynasis. No special gizmo required. @JB- Yes- but that is a “third party” solution, and since it isn’t part of the (now) traditional brake lever, it arguably is a “special gizmo”. Also, there are a lot of folks that call Micro-Shift bar ends “indexed friction shifters”. If you’ve experienced that, you know where that comes from. I have microshift bar ends on two of my bikes, and no complaints with the friction shifting. Had one that came with a disc trucker on my wife’s bike that had too much play in the indexing, but the replacement is working fine. I’ve also had the bar mount version on my ICT, and it the index shifting has worked great for a few seasons now. Where I’m from, “gravel” has a negative connotation. Gravel conjures up boring straight roads with pick-up trucks spitting gravel in your face as they speed by. I’d take an adventure any day, or I try, but on dirt roads, please. On the other hand, when “mountain bikes” first arrived in flat-land Chicago, dealers declared, “We don’t HAVE mountains.” Apparently, it’s just a name. Maybe Chicagoans fear heights. I fear gravel. I’m sure I’ll get over it. Joe, this is a fantastic bike! I have last years version in the classy looking black/yellow and I’ve been loving it. Such a versatile bike, I use it commuting, touring, riding audax as well as offroad (totally agree with you on the “gravel” label, btw), if I had to choose, this would be the one I’d save from a house fire! But again- we all find adventure in different ways. Thanks for not being narrow minded about “adventure” and producing these bikes. @JoeBreeze….I have the Inversion Team in my garage for review for ridinggravel and you will be seeing that soon. What a pleasure to ride lovely steel again. Well done, sir. Always enjoyed talking with you at IBike. I’ve experience my front wheel twisting in the fork after hard or loaded stopping. I had scoffed at people that said you have to have a thru-axle with disc brakes because I’ve had plenty of QR bikes in the past with discs and never had any issues. Since I’m thinking this may be an issue with fork alignment or possibly the design of the fork dropouts, I’m interested to hear if you have any similar experiences. Other than these two things I love the bike. It ain’t no Indy-Fab but I would put this bike up against ANY similarly priced steel framed bike. I love the parts spec on the Pro. I’m 5’10” riding a medium model with a 70mm stem and a Ritchey Venturemax handlebar and I will tell you that this thing can handle ANYTHING. I use mine for commuting, gravel, and even a little chunky Phoenix singletrack. Since this bike has clearance for up to 2.2 tires, I would love for you to mount up a set of light-weight fast-rolling low-pressure XC-race tires in 2.2 and see what you think. 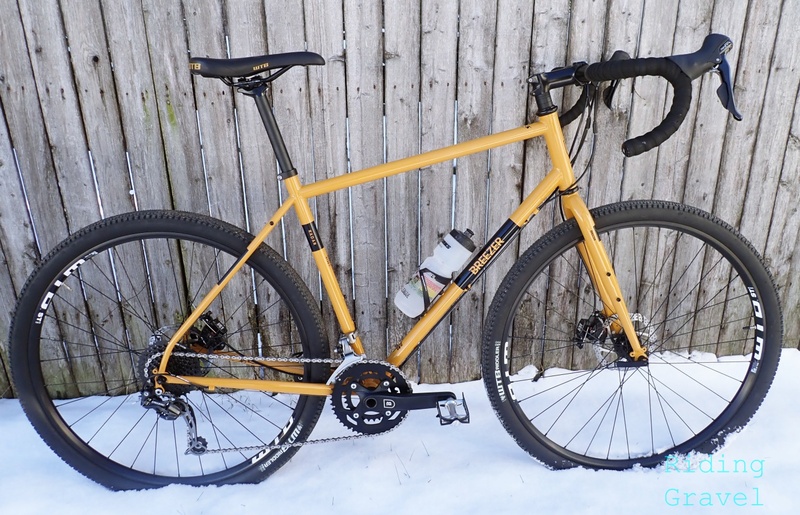 A bike that has the versatility for bikepacking with wider tires and also running narrower tires for daily Gravel grinding could be quite useful. Maybe try the 29×2.2 Teravail Sparwood (light and supple) tires? I picked up the 2018 Expert a couple months back, and love it. Definitely felt LONG in the reach at first! Swapped the stock bar for the lesser reach Cowchipper and that made a big difference. Great bike for me where we are (rural New Mexico) 80% dirt roads and then a few paved majors & highways. Slowly setting it up for New Mexico road & dirt touring/packing. Mine has the slightly larger chainrings of the 2018, which will need to be down-sized a bit for some of the hills/mountains around here. Nice work, Joe! So would you say that I should size down with the Breezer Radar, seems the stack might be a bit high. @David Horner- I don’t know. I have no idea what size you are. If it helps- I am 6’1″ with a 34″ “cycling inseam” and have longer legs than torso. The Large is perfectly fine for me. Minor adjustments like sliding the saddle forward in the clamps of the seat post and/or stem length adjustments are all I would need to get me where I would want to be. In this case I simply slid the saddle forward some to retain as many stock parts on the bike as possible for the needs of this review. If it were my personal rig I would probably end up with a very slightly shorter stem. Bottom line is that the RADAR Expert Large fits me fine. You? I’ve no idea. Yeah I’m 6’3″ with a 36 inseam, and the Breezer Recommendations are for an XXL (Size 60). Totally unsure now, andI can’t find a bikestore that stocks breezer here. Looking for a touring fit by the way and if I slam it, something more sportive. If you can give some advice that would be great, By the way someone mentioned that the data on theBreezer Website isn’t Right. Maybe you could measure the effective top tube or stack or reach to giveme an idea how off the data is. Thanks. I’m 6’2.5 with a 35in inseam and the L (57) is a good fit. Swapped the stock 110mm stem for a 90mm and moved the seat all the way forward due to the long reach. Probably could have used an even shorter stem but the fit is much improved. My seat is just slightly higher than the bars. If you went with the XL at your height I think the reach would be quite long but possibly that could be remedied with a shorter stem and/or different bars. I have a Radar pro and love the bike, the spec is great for the money. It’s extremely versatile and shines on rough roads and dirt. It might feel sluggish to a real road biker, but coming from a commuter this bike is extremely fun to ride, even on pavement. It’s extremely stable which helps keep things in control on singletrack and fast dirt descents. Climbing doesn’t feel like a chore, plenty of stiffness but the ride is still quite comfortable. I definitely recommend it if you’re looking for a true all-rounder that’s a lot of fun, not something that you want to perform like a road or gravel racing/cx bike. You could think of it as the middle ground between a road touring bike and a sporty, rigid mountain bike, in my opinion. I really love the bike’s specs, color, braze ons, etc. but it’s very hard to understand why Breezer is not answering any of my mails and why they don’t clarify the geo data discussion. It’s simply annoying and almost made me switch to another brand, because other brands do reply to customer inquiries. I just bought a 48″ “S” Radar Expert (a closeout from 2017). I’m 5’6″ / 160 and the “M” frame size was just too big. I agree the reach was still long, so I did swap the stem for a 70cm, and have moved the seat forward close to all the way, and now it’s pretty great. I like higher stack height. Very jealous of the subsequent model years that have the hybrid disc brakes, but so far this is a fun versatile bike!